The final chapter in the saga of Gotrek and Felix has come and passed. Was it everything it needed to be to wrap up such an iconic storyline from the Warhammer universe? Slayer picks up a few months to a year or so after the end of Kinslayer, with our duo fighting their way south through the Empire. After defeating Throgg at Prague, Gotrek vowed to get Felix back to Altdorf safely in order to see his wife and child again. We come across the pair as they lead an ambush on a raiding party of Chaos who were already engaged with an Empire force. 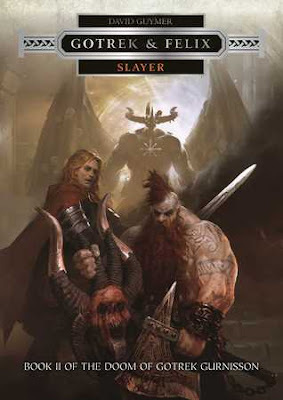 Felix is less then thrilled to have the Slayer along after the climatic events of the last book and he spends a good portion of the novel struggling to come to terms with what happened. After a very action packed battle they continue their trek before learning about the fall of the Empire's capital. Hearing that Middenheim still stood, they figured their next safest bet was to head there. Of course, not everything goes to plan and along the way their plan changes to include an ancient hidden Dwarf fortress and an unexpected old friend. Without ruining the plot anymore, I can say that what happens is suitably epic and fitting for the End Times and a very fitting last adventure for the pair. Just like the last book, the real stars of the story are the characters and their relationships. Felix has become a savior to the men of the Empire they have picked up in their trek south. This is a role that is very ill fitting in his opinion and he spends a lot of the book coming to terms with it and learning how and when to act "heroic" to inspire his troops. He also struggles a lot with his relationship with Gotrek. Unwilling and unable to forgive him for his actions, Felix has to come to terms with what their partnership means. Is it just one indebted to the other, or at some point did they actually become true friends? Gotrek himself spends the majority of the time being a hard as nails fighter, butchering his way through anything in his path. Even though he appears cold and indifferent to anyone else besides himself and Felix (since he vowed to get him home), you start to see how that's not entirely true. A few other stand out characters to me were Gustav, Khagash-Fél, and the old crone who served Be'lakor. Gustav is Felix's nephew, and also accompanied them for most of Kinslayer. I found him a bit more enjoyable to read about in this story since he wasn't under Ulrika's sway. In a way he really is just a mirror of Felix's younger self, something Felix thinks about a few times. In Gustav's mind though he will never live up to the example set by his famous uncle. One thing that I definitely have to give David Guymer props for is making his Chaos champions interesting and believable. It's too easy to just make them a stereotypical bad guy covered in spikes, but in Khagash-Fél, he made someone I wouldn't mind reading about again. Not only is he described as looking quite dissimilar from how we might imagine a champion of Chaos, but his entire dynamic is unique. I really liked the little touch about his sons. He also leads a pretty unique warband of Kurgan. Even though we have had the Kurgan described before, everyone seems to forget that they are more akin to the Mongols then the Norse. Here though we get to see them as the masters of the horse that they are, and are somehow, much more human for it. The old crone doesn't play much of an active role in the story, only using her magical skills occasionally, but she is integral to the narrative. It was her prophecy years ago that set our heroes on their current path. I am also unsure of which side she is really on as she seems to help Gotrek and Felix as often as she hinders them. Slayer really hammers home the importance of the emotional relationships between everyone. Like I said at the start of my Kinslayer review, I have only read one Gotrek and Felix novel before this pair of novels. Despite that I felt very invested in each and every major character. Part of that probably has to do with the fact that Gotrek and Felix are icons of Warhammer and they cast a shadow that's impossible to escape. They always were and always will be, or at least that' what I figured. I always thought "Someday I'll have time to jump into the series and catch up to the newest releases." The ending was very emotional and although I am somewhat unsure if it's actually "The End" with the vagueness of the future of Warhammer, it still hit me right in the feels. This was the last book written set in the Old World that I read. With that last sentence read not only was it a close on the story of a man and his Dwarf best friend, but it was a close on any future story being written in that setting. I'm not going to lie, it left me in a bit of a melancholic mood, just as it should.